searching for a classic modern salad serving set? dimensions: 12 inches long. hand-crafted salad serving set with copper handles. nova68 scandia collection. 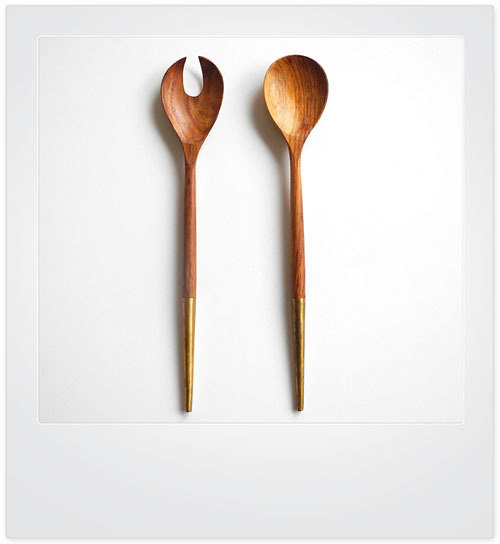 our scandia wood serving set are stylish yet practical salad servers for the kitchen & dining table. mid-century modern styled salad servers display smooth and beautifully grained wood finishes similar to 1950s scandinavian designs. each server featured smooth, hand-applied handles jointed to artful shapes. servers measure about 12" long. price is for the complete serving set of 2 (two) servers as pictured. this beautiful kitchen utensil set makes a wonderful gift idea for housewarmings, newlyweds, holidays... or perhaps the best idea: yourself! scandia 2-piece wood salad servers set.